Sean Scanlon speaks at a press conference about the need for ensuring health care. State Rep. Sean Scanlon, House chairman of the Insurance and Real Estate Committee, lead his committee's approval of a bill aimed at protecting health benefits for women, children and adolescents. Senate Bill 586, “An Act Expanding Mandated Health Benefits for Women, Children and Adolescents,” ensures that the protections afforded to women under the Affordable Care Act will remain for Connecticut women even if the Affordable Care Act is repealed by Congress. 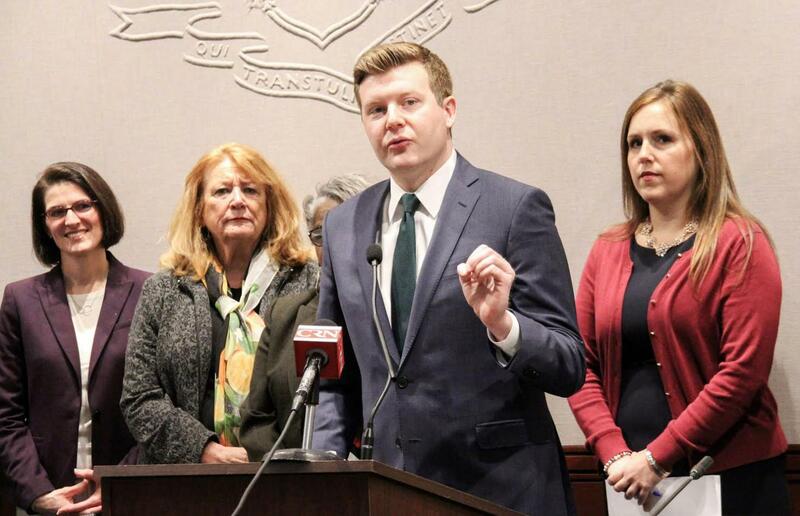 “Thanks to this legislation, Connecticut women can rest assured that regardless of what Washington does when it comes to repealing the Affordable Care Act, state law will from here on out protect the access to basic women's health care services like contraception and breast pumps afforded to them at no cost under the Affordable Care Act,” said Scanlon. Senate Bill 586 seeks to ensure that women will be protected under any circumstances with or without protections from the federal government. The bill expands mandated health benefits for women, children and adolescents; expands mandated contraception benefits; and requires the Commissioner of Social Services to amend the Medicaid state plan to provide expanded contraception benefits. Since 2012 and under the Affordable Care Act, nearly 800,000 Connecticut women have not been charged a copay or deductible for contraceptive coverage resulting in an average yearly savings of hundreds of dollars. SB 586 will ensure that regardless of what happens now to the Affordable Care Act in Washington, the protections essential health benefits it affords to all women will remain law in Connecticut.